In their first home meet of the season, the Coyote track and field team set two new team records at the 2019 Dakota Realty Alumni Meet on Saturday. 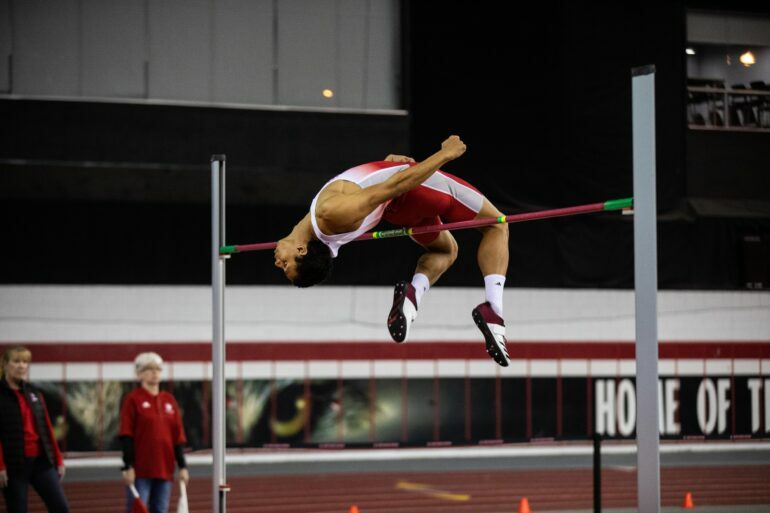 It was a pair of high jumpers who stole the show as junior Zack Anderson and freshman Jack Durst both broke the 7-2 barrier, which had not been broken prior to this season, according to GoYotes. Anderson cleared 7-3 ¾ on his first attempt, beating his own program record by half an inch. His jump was also enough to set a new DakotaDome record, which was set 12 years ago by Minnesota State’s Jim Dilling. Durst proceeded to climb to second in USD history with his jump of 7-2 ½. This is the second week in a row Durst was able to record a new personal best. Both jumpers rank inside the top-15 in the NCAA. High jump squads are ranked according to the sum of a team’s top four personal bests for the season. According to ustfccca.org, USD men’s high jump squad is currently the top-ranked in the nation. Senior Ethan Fenchel set the second record of the day with a 68-3 ¼ weight throw. The mark was enough to earn him first place and break his previous record by eight inches. In men’s shot put, Senior Ben Hammer took home first place with a throw of 60-2 ½. This is the second time in his career he has broken the 60-foot mark. USD’s pole vault had a solid showing once again, with winners on both the men’s and women’s sides. Junior Chris Nilsen took home first place with a mark of 18-8 ¼, tying his season-high. Junior Nick Johnson took third with a height of 16-4 ¾. On the women’s side, junior Helen Falda took first place with a height of 13-9 ¼. Senior transfer Kimmy Peterson reached her highest mark as a USD athlete, clearing 13-7 ¼, enough for second place. Junior Britny Kerr became a triple winner on Saturday. Kerr took first in the 60-meter hurdles in 8.84 seconds, the triple jump at 37-3, and the high jump at 5-5. She was the only triple winner for the team. Junior Samara Spencer captured two titles over the weekend. Spencer clocked 7.63 in the 60-meter, spearheading a Coyote sweep of the event. She was also able to claim the long jump title with a distance of 17-9 ½. Senior Joe Reagan was able to win the men’s 60-meter for the Coyotes, clocking in at 6.90 seconds. USD also swept both the 200 and 400-meters. Junior Tasheka Gordon took the women’s 200-meter in 25.53 seconds, while freshman Collin Brinson won the men’s race in 22.56 seconds. Sophomore Aleksi Rosler won the men’s 400-meter in 50.08 seconds, while sophomore Danielle Thompson took the women’s title in 59.17 seconds. Sophomore Kallo Arno was able to secure the men’s one-mile run with a time of 4:28.17. USD will be split between two meets this weekend, the Arkansas Tyson Invitational in Fayetteville, Ark., and the SDSU Classic in Brookings, S.D.